Like many of you I prefer to enjoy winter from the indoors rather than embrace the freezing cold. 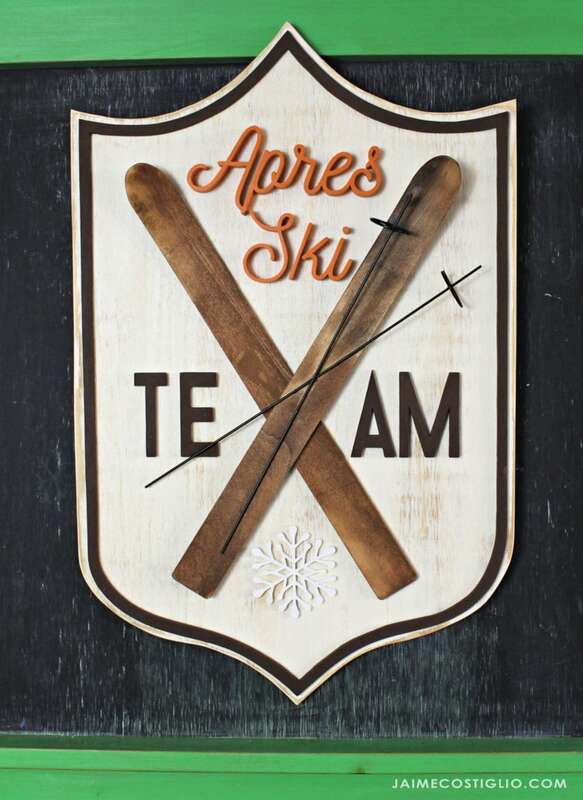 We’re celebrating the winter season with an apres ski themed party today that is part of a blog hop organized by the amazing Ariel at PMQ for TWO. 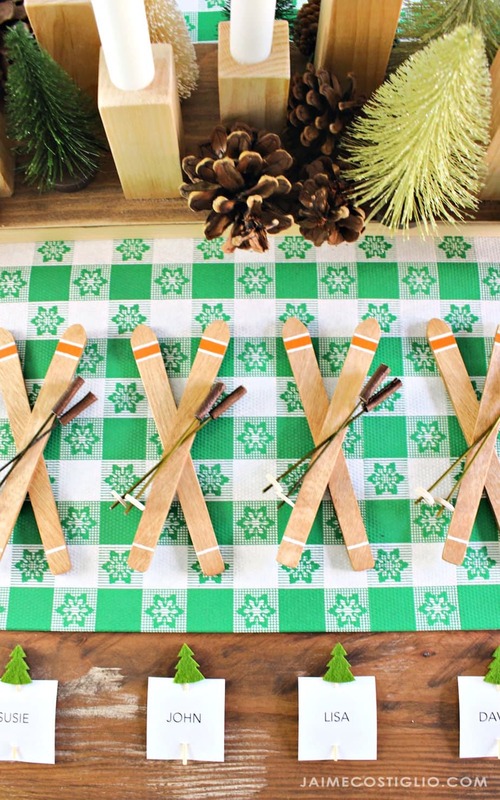 An apres ski theme winter party with DIY decor ideas. 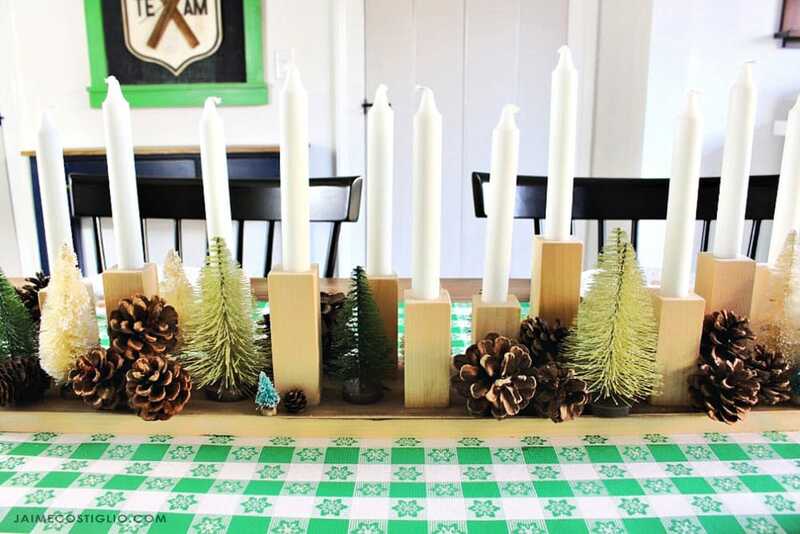 Make a wood candle centerpiece, ski themed place cards and a scrolled wood wall sign. Winter doesn’t have to be all cold and snow rather let’s embrace the season with a winter party. 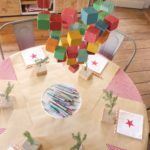 In true DIY fashion I created this winter party decor using a combination of handmade and store bought items. Starting with the centerpiece above I pulled together bits of Christmas decor that are also suitable for winter. Then I made the wood ski place cards and created a scroll cut ski team plaque to pull the theme together. I’m happy to be a part of the Apres Ski team 😉 enjoying a nice cocktail is right up my alley. I designed this wood wall art and cut the pieces from MDF. If you love scrolled signs be sure to follow me on Instagram where I share progress snippets in my stories. For the finishing touch on this scrolled wood wall plaque I attached a set of wood skis. 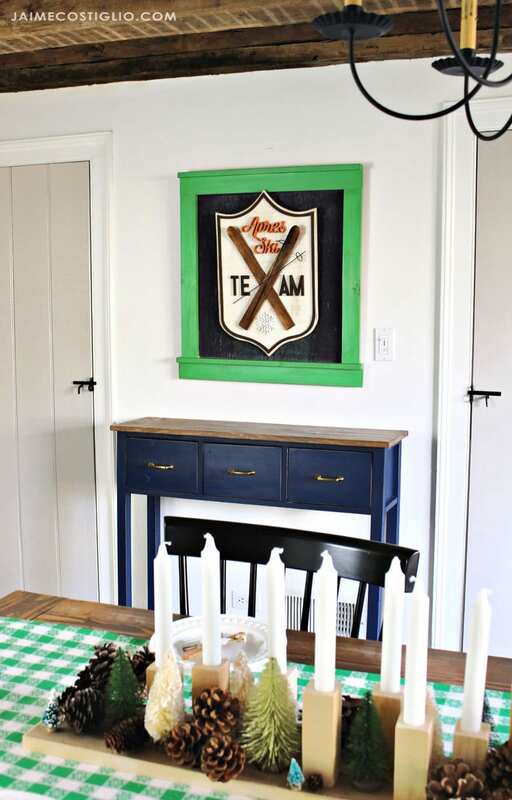 I opted to hang this ski team sign on a framed chalkboard to offset against the white walls. 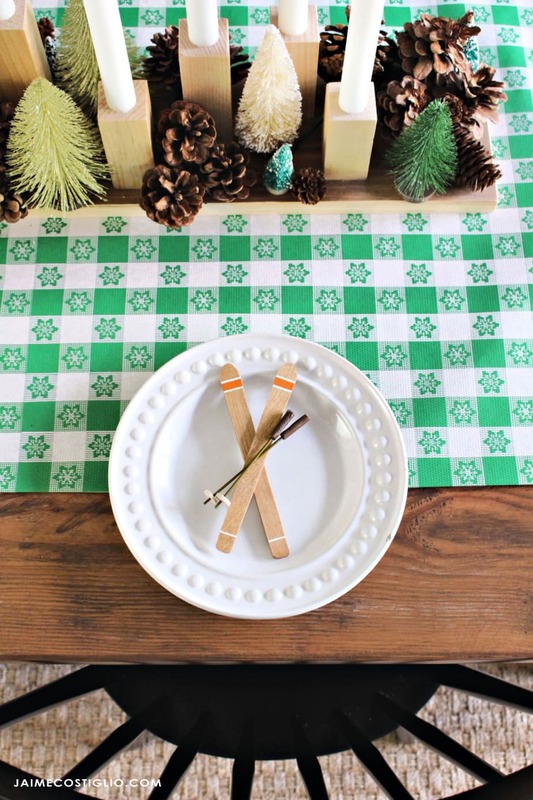 For the table I started with a green and white checkered tablecloth. I love how the green coordinates with the bottlebrush trees and has a snowflake pattern on the print but it’s also a tiny nod towards Spring with the bright kelly green color. 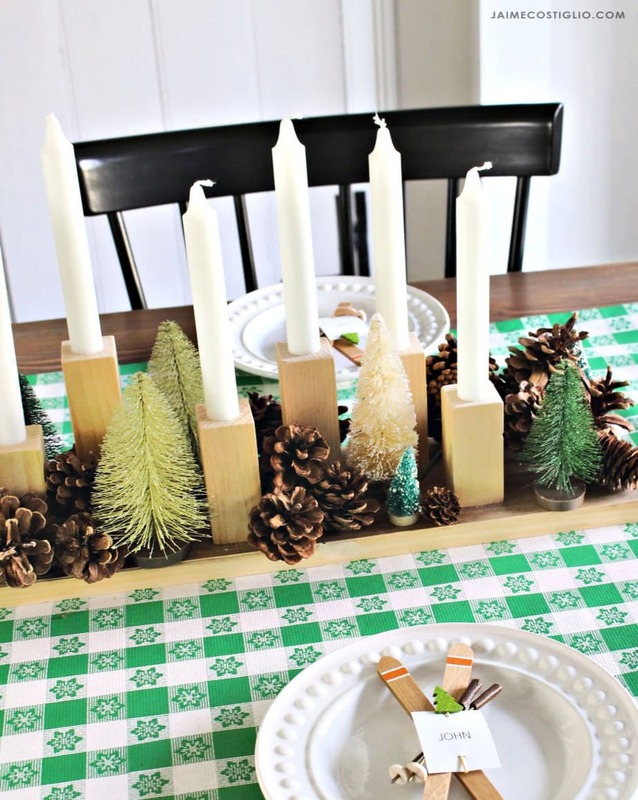 The centerpiece is a collection of 2×2 wood scraps with white candles, bottlebrush trees and pinecones. I cut the 2×2 pieces at varying heights and predrilled a hole for the candles. Then I attached the 2×2 pieces to a 1×6 board cut to fit my table. 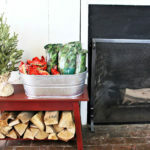 Add in all your bottlebrush trees and pinecones and you have a cozy winter centerpiece. In keeping with the ski theme I made wood ski place cards which double a favors and Christmas tree ornaments. 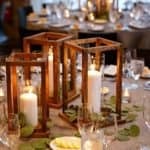 This touch of handmade at each place setting adds charm and character that your guests will notice. Use what you have from Christmas that still speaks to winter without being overly Christmas. 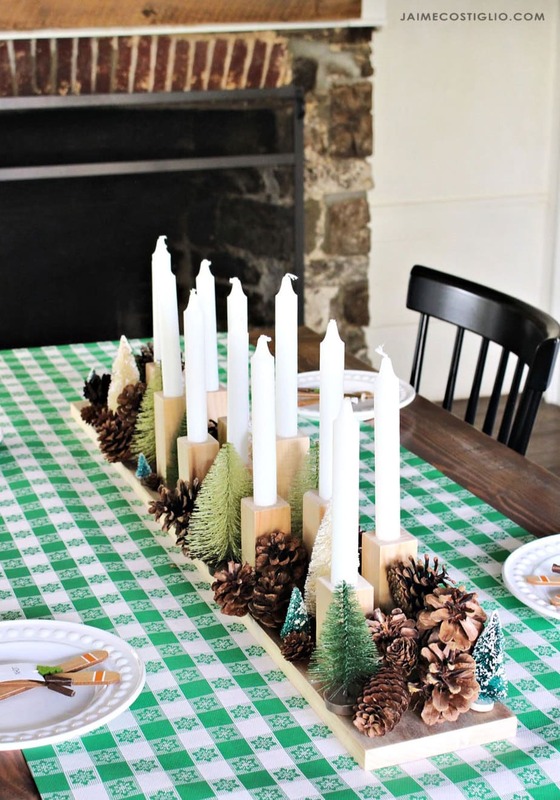 I’ve been collecting bottle brush trees for awhile but any collection of multiple items will work mixed in with the candles. To make the wooden ski place cards cut the skis from 1/4″ plywood scraps. Then stain and paint the stripe detail. The ski poles are metal hangers cut at 4″ long. Then I wrapped one end with a piece of brown leather for the handle. At the base of the poles I sliced a 1/2″ circular wood dowel into thin pieces and made a hole in the center for the metal pole. Use superglue gel to attach all the pieces. You are so talented! And I am a proud member of the Apres ski team as well :-). I love every bit of this!! OMG that sign is amazing, what a great ideas! Thanks Allison, I have a very soft spot in my heart for scrolling. 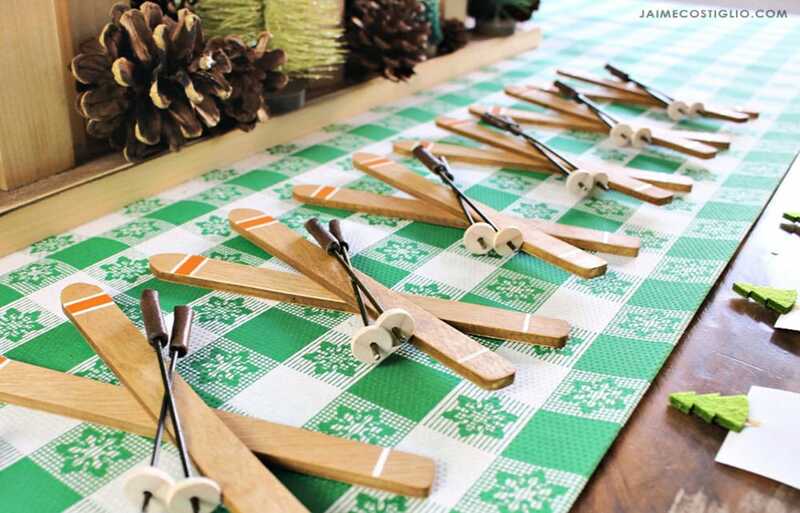 Those miniature skis and poles are so creative and perfect! 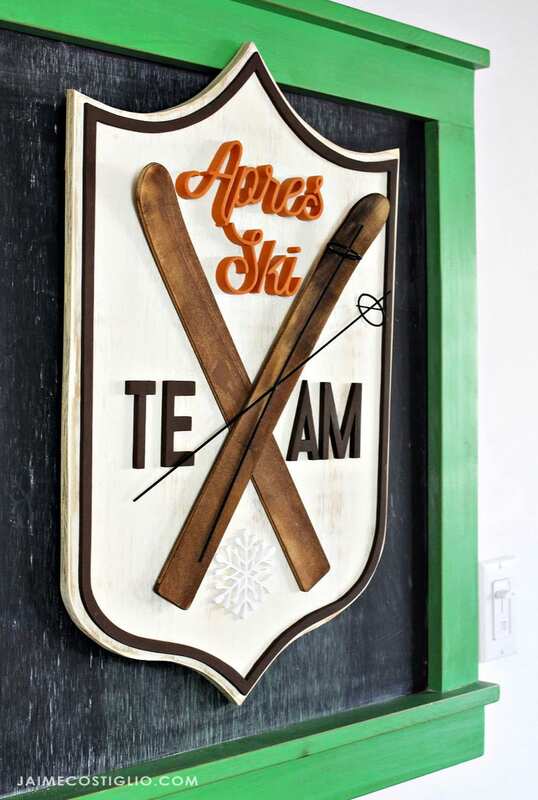 Love the sign and all the apres ski details!! Wow! 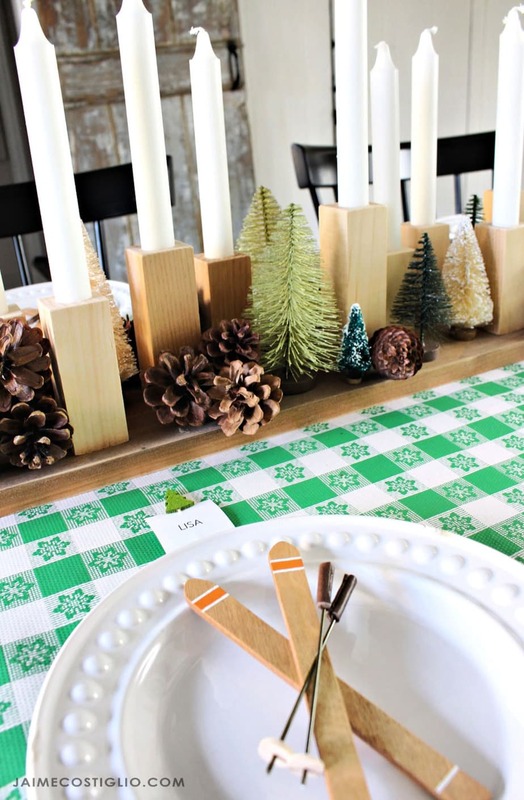 What a pretty winter tablescape! The little skis are adorable and I love, love that sign! Pinned! Thanks Michelle, it was so fun to make all the wood pieces and put it together. Happy Winter! I absolutely love that you made all those skis, and then scrolled that sign! Holy smokes! Your tablescape is giving me all the winter feels! So pretty! 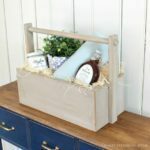 I am loving all your DIYs! Those skis on the plates are my favorite. I want a bunch for our Christmas tree next year! And I really need to get me a scroll saw. It’s been on my list for way too long! Thanks Kati, yes I highly recommend a scroll saw. It’s truly changed my life in terms of ‘making’ things I never thought possible. I wish I had your crafting skills! This is all so cute! Those ski placecards are about the most adorable thing I’ve ever seen! This is so perfect! I love the incorporation of green! It’s starting to feel like Spring. Thanks Teri, a teeny bit of spring 😉 here’s hoping it gets here soon! !